Although it may sound like an oxymoron, "acoustic guitar amplifier" makes a lot of sense for guitarists who want to ensure that what they hear onstage is the same as what audience hears through the PA system.Also, a good acoustic amp can allow performers to shape tone for the room in ways that no onboard EQ system can accomplish. 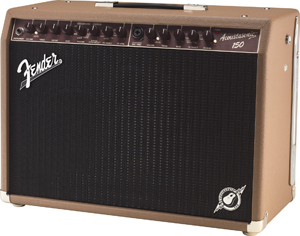 Fender has announced new additions to the its top-selling Acoustasonic amp series. With new tonal innovations and exciting features, the new Acoustasonic 100 Combo and Acoustasonic 150 Combo (pictured) amps are now lighter, louder and more fully-featured than their predecessors. This new, versatile Voicing control feature also supports acoustic players who double on electric guitar. It includes Blackface™, tweed and British amp settings, which makes a second amp just for electric guitar unnecessary. The new ultra-efficient Acoustic 100 Combo, 100-watt power amp includes an 8” foam-surround low-frequency driver and high-frequency tweeter, allowing for crystal clarity and high fidelity. The Acoustasonic 150, 150-watt, stereo power amp is equipped with two 8” foam-surround, low-frequency drivers and high-frequency tweeter, allowing for increased volume and improved acoustic tonality. Additional features on both amps include instrument and microphone channels with independent EQ and effects controls; new feedback elimination control with on/off switch for each channel; patented String Dynamics™ control that tames harsh treble notes; effects including reverb, delay, chorus, Vibratone, and more; XLR line out with level control and ground lift; stereo effects loop and a USB connector for digital recording output.